Katie grew up playing the violin in her hometown of Brisbane. Shortly before starting her Bachelor of Music at the University of Queensland, she fell in love with the viola and has never looked back since! She went on to study for three years at the Australian National Academy of Music in Melbourne. She now freelances as a versatile performer of both modern and early music styles. Katie is passionate about chamber music, and is a founding member of the Chrysalis Harp Trio and early music ensemble The Muses’ Delight. 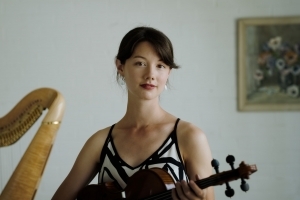 She is a regular violist of Ironwood Ensemble, and is delighted to join Van Diemen’s Band for this program of chamber music. Orchestrally, she plays with ensembles including the Australian Brandenburg Orchestra, Australian World Orchestra, Australian Romantic and Classical Orchestra, Melbourne Symphony Orchestra, and of course Van Diemen’s Band. She also loves to teach, and spent six months in 2017 at the University of Queensland, as guest Head of Viola. In her spare time, she likes to explore a wide range of musical contexts, including folk music, improvising, and community music.